Confession: The real reason I’ve had fried okra on my mind is because on the drive home from Nashville (from visiting Elsie) a few weeks ago, Trey and I stopped at a combination gas station/fried chicken place for lunch. I didn’t actually get any fried chicken BUT I did have some delicious fried okra and a pretty amazing biscuit. Ha. And so of course I realized I needed to get my air frier out and see if I could make some air fried okra, asap! I don’t pull out my air frier every night, but whenever I do, I am always happy. I absolutely LOVE air fried French fries. They are seriously the best. 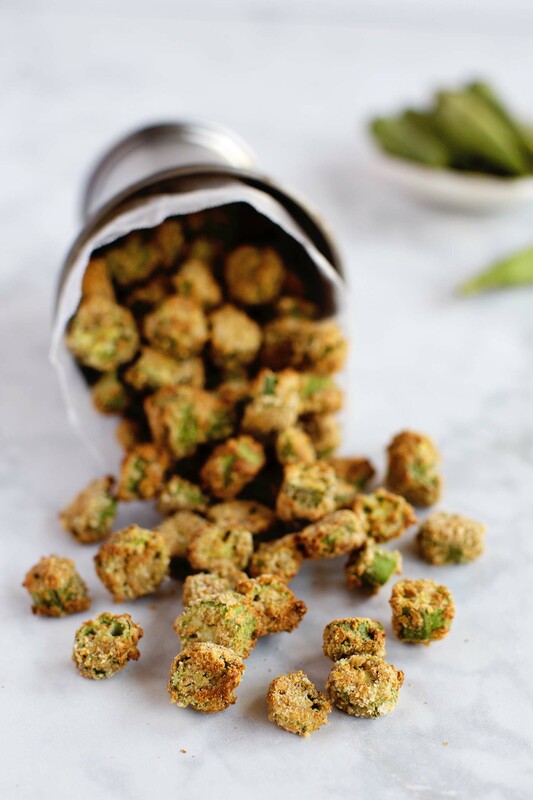 And I am happy to report that although air fried okra is just a little bit more time consuming to make (It’s still easy! It’s just more time consuming than French fries), it’s 100% worth it. So good! 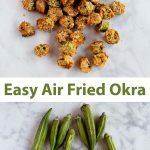 The key is, you want to bread the okra, air fry, then toss in just a tiny bit of oil, then air fry for a few more minutes. If you get lazy and can’t be bothered for the second round of frying, they are still really good simply breaded and fried. 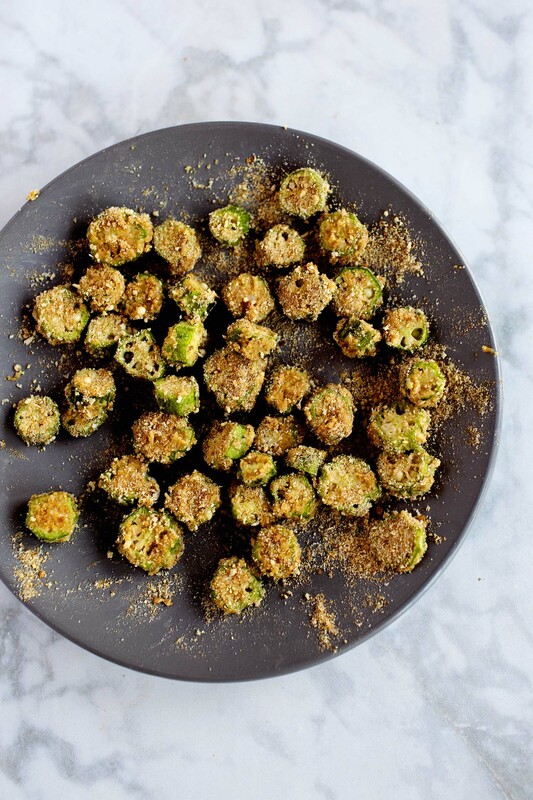 But friends, I’m telling you, just a couple more minutes for a second fry and you’ll be so impressed with this air fried okra! 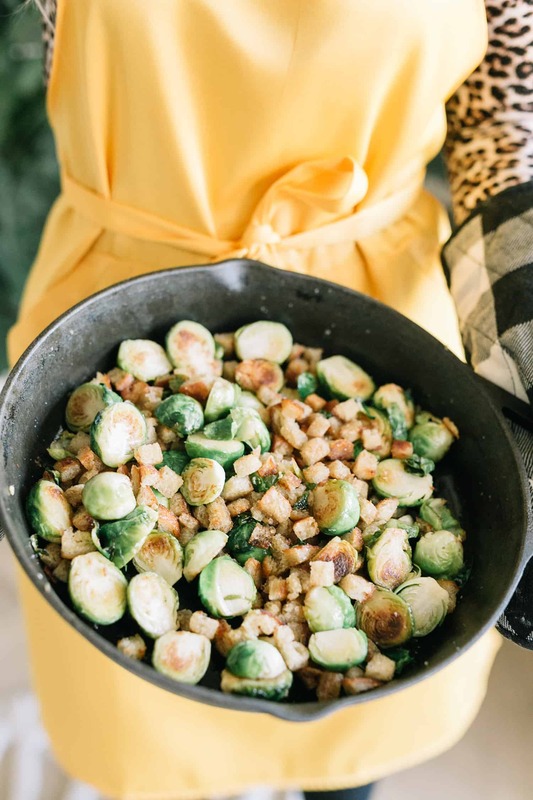 And it still takes very little oil (so not overly fatty like deep fried okra) and I’m also sure you could find and use gluten-free breadcrumbs if you wanted to go that route, too. In a small bowl, whisk together the egg and 1 teaspoon of water, set aside. Rinse the okra and cut off the tops and bottoms. Slice into pieces around 1/4 inch thick. Toss the okra in the flour. Then dip each piece in the egg mixture, then in the bread crumbs. Air fry at 356°F for 6 minutes. Depending on the size of your air frier you will likely need to do this in two batches. Toss the breaded okra in the oil (melting the coconut oil to a liquid if needed). Then air fry for an additional 2-3 minutes. You can swap the flour and bread crumbs for a gluten-free version if desired. I have never heard of this food before. It must not be popular here in the UK. It looks tasty though! 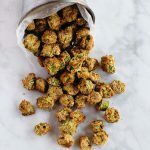 Yum, I love okra in all its forms, and even my picky 4 yr old loves just plain boiled okra – I bet this would go over even better. Do you have an air fryer that you recommend? This looks so yummy. I don’t have an air fryer. . What features should I look for? What do you recommend and why? I honestly just bought a random one from Amazon and have been pretty happy with it. Elsie has a different one and she loves hers as well. So, I would say just read the reviews before you buy but it seems like lots of brands are good. They look so delicious! I haven’t actually seen okra around here in European supermarkets…gotta keep my eyes open! Thanks for the idea, I have never tried this before. 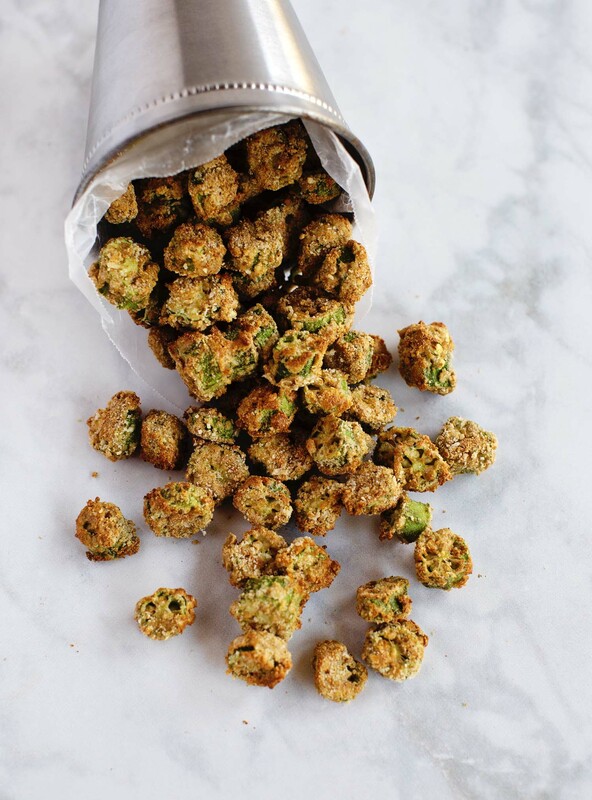 I am from the South and I love fried okra. I tried the Air Fried Okra and it was very very good. I used frozen okra and cornmeal a teaspoon of jiffy mix and pancake mix in instead of flour. I toss in corn oil. I will do it again. Thank you New Jersey. 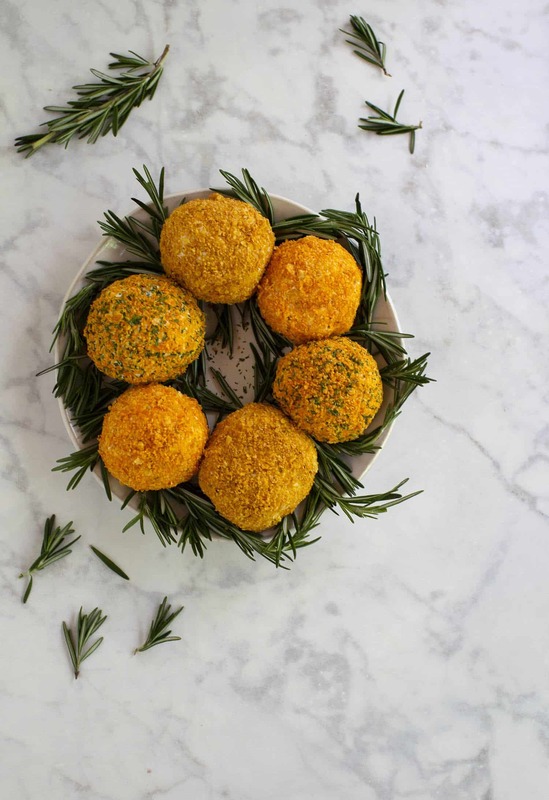 I’ve never heard of air frying before… What’s the difference between air frying and deep frying? Looks delicious! Your air fried okras look so good, Emma! I had my first fresh okras this year and totally fell in love with them 🙂 What a great veg! Have to give your recipe a try. But first, I have to ask you something: was that combination gas station / fried chicken place still in Tennessee? That would be really really funny and so wonderfully Tennessean (I live in East TN since two years and the people here love their food fried). And another question: what kind of air fryer are you using. I heard great things about them but haven’t had the chance to cook with one yet. Oh I love this. 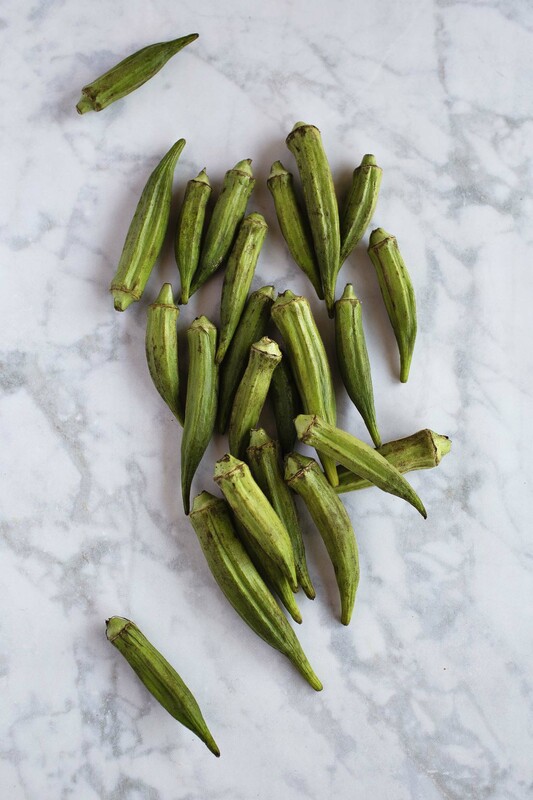 One of my fondest childhood memories is visiting my Aunt Pauline in Atlanta, where she always fried up plate upon plate of okra. There were never leftovers. I have never attempted it myself–too scared–but I think I will give this a whirl! I’ve had good luck with making crispy okra in my oven with the convection fan on. I’ll have to give this recipe a try, the seasoning mix sounds delicious!